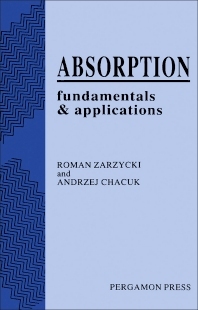 This book gives a practical account of the modern theory of calculation of absorbers for binary and multicomponent physical absorption and absorption with simultaneous chemical reaction. The book consists of two parts: the theory of absorption and the calculation of absorbers. Part I covers basic knowledge on diffusion and the theory of mass transfer in binary and multicomponent systems. Significant stress is laid on diffusion theory because this forms the basis for the absorption process. In the next chapters the fundamentals of simultaneous mass transfer and chemical reaction, the theory of the desorption of gases from liquids and the formulation of differential mass balances are discussed. Part II is devoted to the calculation of absorbers and the classification of absorbers. The chapters present calculation methods for the basic types of absorber with a detailed analysis of the calculation methods for packed, plate and bubble columns. The authors illustrate the presented material with a large number of examples, starting with simple ones for binary systems and ending with column calculation for multicomponent systems. For practitioners and theoreticians involved in chemical and process engineering. Notation. Introduction. Theory of Absorption. Gas-Liquid Equilibria. Expressions of concentrations and properties of fluids. Model of the interfacial region. Thermodynamics of gas-liquid equilibria. Diffusion. Introduction. Velocity of flow of a multicomponent solution. Definitions of fluxes and diffusion fluxes. Constitutive relations for diffusion flux. Methods of calculation of the generalized Stefan-Maxwell diffusion coefficients. Equations of Change for Multicomponent Systems. Introduction. Rate of homogeneous chemical reactions. Differential mass balance equations. Other balance and constitutive equations. One-dimensional diffusion in a gas layer. Unsteady-state diffusion in a semi-finite gas medium. Steady-state one-dimensional diffusion in the real fluid layer. Steady-state one-dimensional simultaneous diffusion and heat transfer in a fluid layer. Mass Transfer in Turbulent Flow. Turbulent flow and restricted applicability of equations of change. Models of mass transfer in turbulent flow. Definitions of mass transfer coefficients. General remarks on transfer models. Some comments on the determination of experimental binary mass transfer coefficients. The effect of solid particles on the rate of physical absorption. The effect of surface tension on mass transfer rate. Interphase Mass Transfer. Introduction. Mass and energy flux continuity across interfase. Overall mass transfer coefficient. Calculation of interphase mass transfer. Simultaneous Mass Transfer with Chemical Reaction. Introduction. The mechanism and model of absorption with chemical reaction. Kinetics of absorption with chemical reaction. The effect of solid on the rate of absorption with chemical reaction. Interphase mass transfer with chemical reaction. Final remarks. Desorption. Mechanism of desorption. Physical desorption of gases. Simultaneous physical absorption and desorption of gases. Supersaturation effect. Desorption preceded by a chemical reaction. Kinetics of simultaneous desorption and absorption with chemical reaction. Balance Equations of the Equipment for Multicomponent and Binary Systems. Introduction. Mass balances. Energy balances. Final remarks. Calculation of Absorbers. Introduction to the Design of Absorbers. The aims of absorption. Basic characteristics of absorbers. Mass balance of an absorber in physical processes (binary, dilute, isothermal systems). Mean mass transfer driving force in various absorbers. Mass balance of the absorber for pure gases. Conditions for the application of chemical absorption. Thermal effects in absorption process. Calculation of desorbers. Models of fluid flow in absorbers. Methodology of absorber calculations. Packed Columns. Introduction. Hydrodynamics of packed columns. Mass transfer coefficients in packed columns. Cocurrent phase flow. Balance equations of packed columns for binary systems. Balance equations of packed columns for multicomponent systems. Simulation of industrial packed columns. Plate Columns. Introduction. Sieve plate hydrodynamics. Mass transfer kinetics on plate column. A theoretical plate. Methods of column calculation using the concept of the theoretical plate. Balance equations for diffusional methods of plate column calculation. Bubble Columns. Introduction. Hydrodynamics of bubble columns. Mass transfer coefficients in bubble columns. Balance equations for bubble columns. Appendix. Solution of algebraic equation systems. Systems of ordinary differential equations. Subject Index.